Anne Kelleher has been writing and publishing for 20-years, but at this point, she has come full circle from the mass market paperback crowd of her first book (Anne Kelleher Bush – Daughter of Prophecy). That novel centered on a dystopian fantasy world with well-defined but complicated rules, rituals, and surroundings. Apparently, she has gone minimalist, and it’s quite refreshing. 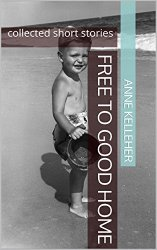 Kelleher’s Free to Good Home is a collection of short stories (the book itself is nearly 200 pages). The stories are little tidbits, perfect for snacking on during a spell in the hot tub, or before bed. The writing is crisp and clear, with just enough description and plenty of flavor to keep you interested and turning the pages. Each story has its own twists and presents the “what-if’s” of Kelleher’s imagination and prey on our own slightly unnerved acceptance of the world around us, and what’s to come. Maybe. Half of the stories are devoted to what she titles Celebrity Supernatural, and it’s nice to read such clear and precise writing. Her stories are well-constructed and fun to read. There is a drawback to each story, unfortunately. They end. The first, titled as the book, Free to Good Home, takes us to an undetermined time in the future where old age is viewed quite differently than now, or maybe it isn’t. We just don’t talk about it over dinner and drinks. The story’s plot-line is well past the “Now that your days are dwindling to a precious few, spend them with us, at Shuffleboard City.” No. This is a time where adoption is for the aged, not the young. The problem is that I wanted to take the story and run with it. Take it with me. Take it to full-spread and 250 pages, but alas, it ends too quickly, just as our own lives do. Life’s short. Enjoy good writing. Kelleher’s collection of stories in Free to a Good Home is a good investment of your time.